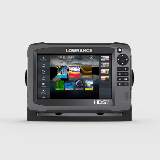 Lowrance 7" HDS Carbon. Price is with NO Transducer. Add Transducer option during purchase. The Lowrance® HDS-7 Carbon features a new 7-inch ultra-clear SolarMAX™ HD multi-touch display using high-bright LED backlighting and advanced anti-reflective coatings to create wider viewing angles in any lighting condition. Only in HDS Carbon will you find superior color accuracy and a boosted high-resolution viewing panels specifically designed to truly maximize today’s leading sonar. Loaded with dual core high performance processor, HDS Carbon delivers faster redraw speeds and quicker response times for dual-channel CHIRP sonar, dual network sounder views, StructureScan 3D® and StructureMap™ plus split-screen views showing all this and mapping at the same time; it has enough reserve brute strength to drive future high powered fishfinding upgrades. HDS Carbon brings modern “smartphone-like” comfort with integrated wireless and Bluetooth® connectivity that supports the most advanced marine technology including a Network Analyzer that notifies user when a new software is available, a system Service Assistant that allows user to transmit a detailed report of their electronics network direct to technical advisors for custom hands-on assistance. HDS Carbon is the most versatile combo available today, it can view and control Mercury® VesselView® Link, be paired with Power-Pole® shallow-water anchors, and control SmartSteer™ trolling motor/outboard motors. An expansive list of safety and entertainment plug-ins are available to complete your network. You can navigate easily with HDS Carbon behind proven Lowrance navigation, a 10 Hz internal GPS antenna and a multitude of mapping options accessible from the unit’s dual microSD card slots or via wireless download from GoFree® Shop. Easy To See: 7-inch, LED-backlit, multi-touch, SolarMAX™ HD widescreen display. SolarMAX™ HD touchscreens produce wider viewing angles from anywhere in sight. Using a unique balance of high-bright LED backlight and advanced anti-reflective coatings along with superior color accuracy and a boosted high-resolution viewing panel, a wider operating temperature range and added moisture-proof optical layers produce clear visibility in any lighting situation. Simple To Use: Unique Lowrance® interface featuring quick-response touchscreen or keypad control, intuitive software, and protective coatings deliver performance in the most rugged on-the-water conditions. Lightning-fast, fingertip access to all HDS Carbon features. Dual-Core, High Performance Processor: HDS Carbon employs a dual-core, high performance processor with more than enough agility, speed and power providing faster redraws and quicker response times to easily drive today’s best technology, like StructureScan® 3D, Mercury® VesselView® Link and the Lowrance Outboard pilot. And, it has enough reserve brute strength to drive future high powered fishfinding technologies, too. Dual-Channel CHIRP Sonar: Never miss fish targets with two CHIRP frequency channels at the same time low, medium or high. Keep favorite high CHIRP frequency visible for increased target separation close to the bottom or in tight schools and now view the low frequency channel at the same time to cover more of the water column with wider and deeper cone angles. Dual Network Sonar Views: Cover more water and mark fish targets more clearly from a network of CHIRP sonar transducers. Watch sonar views from bow-mounted transducer and the in-hull or transom-mounted transducer at the same time on the same display. Most Advanced Fishfinder Technology: Simultaneously view CHIRP Sonar with StructureScan® 3D or StructureScan® HD to get the best possible view of fish and structure, below and to the sides of your boat. Quickly Make Adjustments: HDS Carbon has a high performance processor that produces lightning quick redraw speeds and faster sonar updates. It easily powers Carbon’s intuitive user-interface that includes scrolling menus, cursor assist, snap-to setting markers and innovative preview panes with quick-touch slider bars. Stay Connected: Integrated wireless connectivity with the Lowrance® GoFree® App and other onboard devices, allows you to download software updates and map purchases ─ for immediate use ─ in addition to viewing and/or controlling the display wirelessly using supported tablets and smartphones. Network All Components: Plug-and-play compatibility with Lowrance performance modules, including Broadband Radar, SonicHub®2 Marine Audio, SiriusXM® Marine Weather and audio, Class B AIS and DSC VHF, as well as industry-leading technologies, like Mercury® VesselView® Link, Bluetooth® control of Power-Pole shallow water anchors equipped with the C-Monster Control System and the SmartSteer™ interface, featuring control of MotorGuide® Xi5 trolling motor and the Lowrance® Outboard Pilot. Wireless Diagnostic Tools: The Network Analyzer detects devices with out-of-date software, while the Service Assistant allows users to send a detailed report of networked devices to Navico Service for quicker resolution of software/technical issues.